Are you looking for a few cool hip hop tattoos so that you can get some great ideas for your next piece? Many of hip hop's hottest stars are inked so it shouldn't be too hard to find inspiration! The Game has several tattoos, including the NWA logo on his chest (a tribute to the group of the early '90s). However, his best known tattoo is next to his eye and is a tribute to his LA heritage. Nelly's best known piece of ink is on his right bicep. The piece is a hand of cards (where all of the cards spell Nelly instead of their proper number designations) with a visible spade and a set of dice rolling out of the flames. One of the things that Eve is best known for outside of her music is for the set of paw print tattoos placed on both of her breasts. 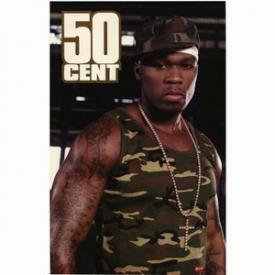 50 Cent is one of the most inked hip hop stars. In addition to numerous pieces on each arm, he also has a full back tat that features his "50" logo across the full length of his back. Dr. Dre has several tattoos, but is perhaps best known for the pieces on the back of his hands. Both hands feature spider webs rising out of flames. 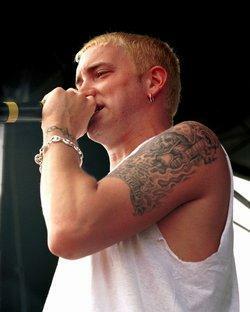 Eminem has several tattoos including the D12 logo on his arm (a callback to a former group that he was part of). However, his largest piece is a portrait of his daughter Hayley that is meant to remind him of her when she's not around. Ludacris has several religious tattoos on his arms. On his left bicep, there is a cross featuring a representation of Jesus. On the other bicep is a set of praying hands pointing up to the sky. Little Wayne also has numerous tattoos running up both arms, his chest and his back. He has a set of dice near one of his shoulders and teardrops next to one of his eyes. If you are strongly passionate about hip hop, perhaps getting a few song lyrics from your favorite artist can be a meaningful way to pay tribute to your passion. If you are a fan of a particular hip hop star, consider getting his or her logo, just as 50 Cent has his own logo on his back. A common thread in hip hop ink is face tattoos. If you are bold enough, think of a design that means a lot to you, but is simple such as a cross or small emblem. Large murals are also popular in hip hop. A full back piece of some original graffiti ink can look great. You can even customize the look by putting your own tag in the piece or having your tattoo artist mix it up. Many hip hop inspired tattoos are about being bold and showing pride. Consider getting a large piece that shows something about you on your arm. If you are religious, consider a giant cross. If you are a singer, consider a giant microphone. Hip hop is popular because it speaks to people. Many hip hop stars get inked so that they can share a part of themselves that they feel as passionate about as music. If you carry this idea over to your own ink, you are sure to have a piece you'll be satisfied with.